A 54-year-old man released from prison under California’s early-release program was back behind bars today, accused of leading deputies on a high-speed chase that ended with him crashing into several parked cars in Escondido. The pursuit began over a suspected traffic violation in the area of Auto Park Way and Meyers Avenue around 9:40 p.m. Thursday, according to San Diego County sheriff’s Lt. Clayton Lisk. It ended in the area of Juniper Street and Felicita Avenue after the man crashed into several parked cars and ran away, Lisk said, noting deputies quickly caught up him. 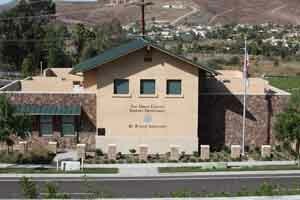 San Diego Sheriff’s Department 4S Ranch station. Photo courtesy sheriff’s department. After taking the man into custody, deputies learned he had several outstanding felony warrants and was among those released from prison under California’s early-released program, Lisk said. Because he crashed his vehicle, the man was taken to Palomar Medical Center to be checked out for possible injuries, Lisk said, adding he will be booked into jail once medically clear. A female passenger in the man’s vehicle complained of pain and was also taken to the hospital. Despite staunch opposition from local law enforcement and politicians, the U.S. Supreme Court last year ordered an immediate end to severe overcrowding in California’s prisons, ruling that the packed conditions equated to “cruel and unusual punishment.” The decision left California in need of finding other quarters for nearly 10,000 inmates, which led many to be transferred to county jails and many “less serious” offenders already housed in county jails to be set free early.